The inhabitants of Kodagu, especially those who spoke the Kodava thakk (Coorgi) language and followed the native culture in varying degrees, are called as Coorgs in the present work. The largest and dominant community among them who survive into the present age is called the Kodavas. Some of the others who have family names among the Coorgs are the Ammas (Amma Kodavas), the Kodagu Heggades, the Airis, the Kodava Mappillas and the Keimbatti. While the Kodavas and the Amma Kodavas were present in Kodagu for centuries prior to the reign of the Rajas (c.1600-1834), most of the other communities entered Kodagu from Canara and Malabar during the reign of the Rajas. Nearly 60 clan names have been mentioned in the Palame (‘Coorg folk songs’) compiled by Nadikerianda Chinnappa (see below). The Coorg family names are called Mane-pedhas, or 'house names'. The Kodava 'mane-pedha' (house-name) signifies the clan name. Unlike common practice, among the Coorgs the family name precedes the personal name  . For instance as in Kodandera Cariappa, the late general (Field Marshal K M Cariappa or Kodandera Madappa Cariappa)'s Kodava name, where Kodandera is the family name and Cariappa is the personal name. The Coorgs have family names which have a well-meant root word. Presently there are over a thousand Kodava mane pedhas. There are family names among other Coorg communities as well, for instance there is the Benanda and the Chottalyammanda families of Amma Kodavas, the Alira and the Minakara families of Kodava mappillas, the Airira family of Airis, the Vananda and the Chakkotira families of Kodagu Heggades. Some clan names are used by more than one community and are unrelated. When these family names were recorded in the records they were used in various forms. For instance, Natolanda would be recorded as Natolana, Kattera as Kattemane, Ketolira as Ketoli and Mukkatira as Mukkati. There are Pemmanda, Boppanda and other such clan names in both the Kodava and the Heggade communities. The Arebhashe families took over the names of the former families who lived in the lands that they occupied. For example, there are Kodava Mukkatira families and Arebhashe Mukkati families as well as the Natolana, the Guddera (also called Guddemane) and other families of Arebhashe. Unlike the mentioned others who speak Kodava thakk, the Arebhashe speak a dialect of their own. The earliest mention of a family name is in the name Pemma Virappa. Pemma Virappa was the last independent Raja of the early Changalva line. He succeeded Mahadeva, a Raja who was slain by the Hoysala Rajas of Southern Karnataka. The 1174 CE inscription mentions Pemma Virappa as having summoned Ella Nadina Kodagaru ('Kodavas from all regions') . This inscription is the earliest known mention of the Coorgs, thus showing that they were an ancient people settled in South India before a thousand years ago. The name of the Raja, Pemma Virappa, sounds very similar to the traditional names of the Coorgs. Kaliat Ponnappa, Cheppudi Chittavva, Ketoli Changappa and Mukkati Ipanna were some ancient Coorg personalities. They could be known as Kaliatanda Ponnappa, Cheppudira Chittavva, Ketolira Changappa and Mukkatira Ipanna as well. So Pemma Virappa would be known as Pemmanda Virappa. The Pemmanda are a well-known Coorg family name. Names like Virappa, Monnayya, Biddayya and Ipanna have been used by the ancient Coorgs but are no longer used by the present day Coorgs. Pemma means 'respected' in Kodava thakk, this is the root word for the common Coorgi name Pemmayya (or Pemmaiah) as well. However Pemma Virappa was a Changalva, member of a clan which was not traditional Coorg Hindu by religion, but Jains. There is no mention of Pemma Virappa being a son of Mahadeva the previous Changalva. On the other hand the Changalvas had single names, like Madeva, Odeyatya, Annadani, Malli-Deva and Harihara-Deva and no such Coorg sounding names. The clue lies in the practice of the later Haleri Rajas (c.1600-1834 CE) in converting Coorgs into Lingayites and marrying them. 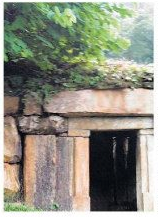 There was Mukkatira Ipanna (Aiyappanna according to some accounts), a born Coorg, who was converted into a Lingayite and married to a Haleri princess Devammaji. The couple is mentioned in the famous Kannada novel Chikka Vira Rajendra which won the Jnanapitha award, a National literary award. So we can assume that Pemma Virappa was a son-in-law, a relative, a general or a minister of the former Changalva Mahadeva whom he succeeded. According to B. L. Rice there was the mention of a Kodava family name in an inscription dated around 1000 CE. This mentioned name was Kunindora (probably meaning 'Kunjindera') which, however, no longer exists. This would hence be a clan which has gone extinct over the ages. Scientists believe that the human race originated in Africa and spread across the planet over tens of thousands of years. In the prehistoric times, in the absence of written records, the early Coorgs (Kodavas) settled Kodagu (Kodavu or Kodagu nad) and tracts of neighbouring Western Mysore and Northern Malabar and brought the wilderness of the region under cultivation. Before them there were hunter-gatherer tribes wandering in the forested hills of South India. One must understand that those were the times when political borders didn't exist. The Coorgs were in the region of Kodagu even during the times of the ancient Tamils of the Sangam age (c.300 BCE-300 CE). Kodagu was called Kudukom, the 'land to the west' of the Pandyas, one of the Tamil Sangam kingly dynasties. There are three Coorg clan names Cheranda, Cholanda and Pandianda ('Pandyanda') which sound very similar to the names of the chief Tamil Sangam kingly dynasties-the Cheras, the Cholas and the Pandyas. This doesn't mean that these families were descendants of these dynasties but that their ancestors who founded the respective clans and names knew of these ancient dynasties. In history unconscious India, where history wasn’t usually written and preserved for posterity and where the ancient people didn't travel beyond their villages and knew of no other place, this could only mean that the Coorgs lived in the times of those famous kings. There are also half a dozen Coorg clan names each which begin with the word 'Konga' and 'Changa', there were two Jain dynasties (the Kongalvas and the Changalvas) to whom the families owe their origins. These two dynasties ruled Kodagu in 1100 CE and their dominions were known as Konga naad (in and around Southern Hassan and named after the Salem region in Tamil Nadu) and Changa naad (in and around Western Mysore, probably named after a region in Shimoga in Karnataka). Periya Raja was a Changalva Raja who built Periyapatna town in the 1580s. The Wodeyars of Mysore defeated the Changalvas, captured Periyapatna and drove out the Coorgs from that region. Those Coorgs settled down among the other Coorgs living in Kodagu. Presently there is one family name among the Coorgs, called the Periyanda. Legend has it that one of the early Haleri Rajas (either Muddu Raja or Dodda Virappa) gave the Coorgs their family names in the 17th century. But this can't be true because there were people with family names, like Kaliatanda Ponnappa, a famous Coorg leader and religious man, who lived in circa 1600 and who lived before both the Rajas. If the Raja had given them their family names then he would have given them in Kannada, the language of the offices and not in the colloquial language, Kodava thakk. Besides, the Coorg folk songs, some of which predate the Haleri Rajas, mention many of the Coorg family names. Richter's book says that the Coorg family names are of Kannada, Malayalam, Tulu and Tamil origins  . However, unlike what he says, almost all the Kodava family names are of Kodava thakk origin. All the Mane pedhas had either of the following common suffixes, meaning 'belonging to': -era/ira (plural) or -ada/anda (singular). The family names could be patronymic (affixed with 'appa') or matronymic (affixed with 'amma'), the latter is found among the Amma Kodava family names and a few other Coorg clans. The Coorgs kept short names in prevalence in the South India of that age, like Muthu, Achchu, Pemma, Boppa and so on. When addressed by a younger person or a sub-ordinate these names were then suffixed with an '-appa' or an '-ayya' (father), an '-anna' (brother), an '-amma' or an '-avva' (mother) or an '-akka' (elder sister), whatever maybe the case. Previously not all the Coorgs had a family name, for instance Utta Nayaka, the king Dodda Virappa's arch-rival, isn't known to have had a mane-pedha. However, his descendants are known as the Nayakanda family ('Nayaka' or lord) of Armeri village in Beppunad today. By the 19th century every Coorg had a family name. Those who failed to use a family name were given pejorative family names like among the Boda Kodava. Universally, most family names or surnames are classified by etymologists under five categories depending on their origin: based on an ancestor's personal name, on their occupation, on their location, on their nickname or on their adopted ornamental name  . The family name of the famous Indian Chanakya was Koutilya, which meant 'belonging to the jar'. Family names of the Europeans were like Brown, Rice and Smith. The Marathi-speaking people have family names such as Gavaskar, Tendulkar and Wadekar. The Parsis have family names like Irani (from Iran), Engineer, Seth (moneylender) and Vakil (lawyer). As you can see some family names were derived from professions, titles, place names, while some others were based on totemic things. The Coorgs are no exception. Most of the Coorg family names can be classified on basis of their origins into the following categories: based on the ancestor's personal characteristics, place names, occupational names, religious names, and names of rulers, of animals, plants, fruits and vegetables and based on the ancestor's personal name, nick name or ornamental name. Some of the family names were based on personal characteristics like the Mandeda (Mande or 'head'), the Mookonda (Mooku or 'nose'), the Moolera (Moole or 'bone'), the Bayavanda (Bayi or 'mouth') and the Uddapanda (Udda appa or 'tall man'). Some are based on village names like the Kaliatanda (Kalyat is the name of a place in North Malabar near the Kodagu border and also the name of a ritual dance form Kali atta popular in Kodagu and in Kerala), the Nadikerianda (Nadikeri is a place in South Kodagu), the Kavadichanda or Kambadichanda (Kavadi is a village in Ammathi nad), the Chembanda (Chembe-beliyoor village near Virajpet), the Mundiolanda (Mundiole village of Kodagu) and the Kundiolanda (Kundiole village of Kodagu). Some of the family names are based on names of fruits like the Balera (Bale or 'banana'), the Chekkera (Chekke or 'jackfruit') and the Mangera (Mange or 'mango'). Sometimes clans were names after objects such as in the case of the Coluvanda (Kolu, plough). Some other family names were based on the occupational names and on religious names, for instance Mukkatira (Mukkati, a temple functionary). Another family name was Kotera (Kote or 'fort'). The family's ancestors might have guarded or built one or more forts. Pattada, Pattamada and Paruvangada, were names of religious origins, the terms Patta and Paruva were the Coorgi terms for a priest. When the temple of Bhagamandala had been captured by the Mysore Sultans and its fort was occupied by their forces, the young temple priest (or Pattama) used to perform the daily temple rituals to the river goddess Kaveri in hiding in the forests under the patronage of a Kodava man. This Kodava man's clan came to be known as 'Pattamada'. 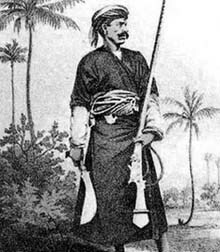 Nambimada Muthanna was the legendary ancestor of the Pardanda clan; hence we know that Nambimada was the former family name of the Pardanda. Nambima was the Coorgi word for a Namboothiri (Malayali Brahmin) temple priest, signifying that the ancestor must have done some services to a priest. Sometimes the family names were formed from an ancestor's name, for instance the Boppanda (Boppa), the Biddanda (Bidda), the Somaiyanda or Chomaiyanda (Somayya or Chomayya, both being the same name but pronounced differently). Some others were derived from a nickname or ornamental name of the ancestor, or ancestors, such as the Mandetira (Mande-yeti, 'head held high'), the Maneyappanda (Mane-appa,'father's house'), the Apparanda (Appa-aru, 'father of six’), the Mandepanda (Mande-appa, 'wise man'), the Kuttanda (Kutt, 'knock'), the Cheriyapanda (Cheri-appa, 'young father', or father's younger brother), the Nellamakkada (Nella-makka, 'good children') and the Cheppudira (Cheppu-pudi, 'hold a money container'). (Some sources call this Mookanda clan as Mookonda. While the 2003 English version of the Pattole Palame calls them Mookanda, the 2006 Kannada version of the same book calls them Mookonda. An earlier edition of the Pattole Palame calls the family Mookagonda. There is a place known as Mookanda Bane in Bavali. But presently there are no Mookandas in the Bavali village. Hence this mentioned family is an extinct clan of that village. On the other hand two Mookonda families exist in Bilugunda and in Devanagiri villages near Ammathi and Virajpet towns respectively. Some people who are not familiar with the Bilugunda region call the Mookonda of Bilugunda as Mookovanda, a clan name that doesn't exist, hence a mispronunciation. Update (2016): The Mookanda of Bavali have been alternately called Mookonda as well. This has been found in various records as well. An old document came up where the present-day Mookonda of Bilugunda was called Mookanda. Also, I have been purposefully addressed as Mookanda Kushalappa instead of Mookonda Kushalappa. The Bavali branch, which was the oldest and probably the parent branch, is now extinct. The last member of that branch was a lady who married into the Biddanda family. The Bilugunda and Devanagiri branches continue to exist. The Devanagiri branch is also called Achimudiyanda of Makkandur, a Kodava family in existence today. An oral narration exists that an old Mookonda couple in Devanagiri had no children. At that time members of the Achimudiyanda family came to Devanagiri during times of warfare in Makkandur. They were adopted as heirs by the old couple. It is not known if the entire Devanagiri Mookonda family descended from the Achimudiyanda family or if only some of them are. Bowman, W. D. 1932. The Story of Surnames. London: George Routledge & Sons. Emeneau, M. B. 'Personal Names of the Coorgs', Journal of the American Oriental Society, Vol. 96, No. 1 (Jan. - Mar., 1976), pp. 7-14.